Wednesday, December 4, 2013: Okay, first a note of clarification, actually its Bill and Kit’s 2013 and 11/12 to 2014 and 5/12 Excellent Adventure…..hope that clears everything up? 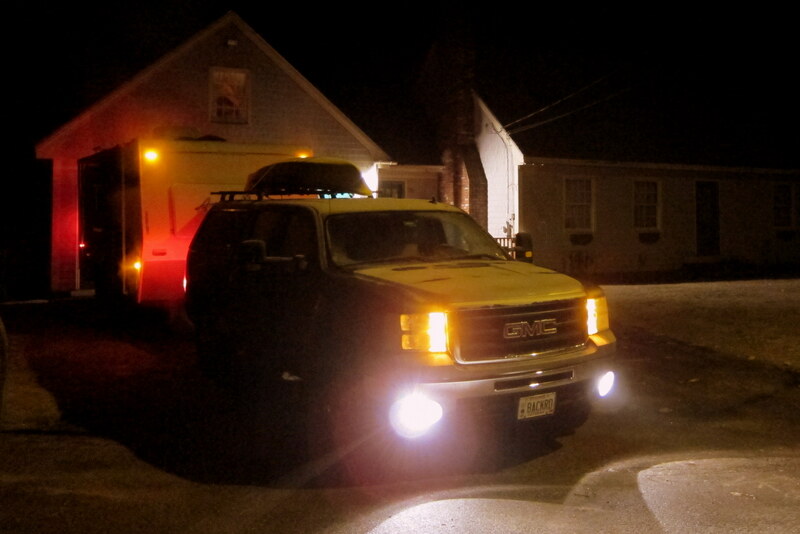 Underway at 0400 hours for our sixth consecutive winter RV trip to parts warm and southwest. It is 27 degrees and the relative humidity is 83%, which means Frozen Fog…..the driveway is an ice skating rink and the road by our home is only slightly better. Decided to carefully pick our way through the neighborhood and test the waters (pun intended) on the Interstate. Fortunately the proceeding long haul truck traffic had rendered the turnpike surface in much better shape then the secondary roads. So off we tentatively meander to the south. So why are we heading out a month early? Well, funny you should ask…..we decided to spend Christmas with our two youngest grandchildren out in Las Vegas. Jack, an African American is a Black Jack Dealer (what else?) at the MGM Grand Casino and Tucker works as a Bouncer at Club Hoop-d-Do. We are certainly looking forward to an interesting and fun filled holiday season! OK, that stuff above is BS…..Tuck is six and Jack just turned nine and they’re both Caucasian. Still looking forward to a grand old time, however! Within the hour we made our customary safety pit stop at the Kennebunk rest area. I checked all eight wheels as well as the hitch and all ancillary equipment. Everything checked out, so on the road once again we continued south and crossed into the state of New Hampshire at 0605. From there we chose the tried and true transit through Massachusetts, Connecticut and on into New York before crossing the Hudson River on the Hamilton Fish Newburgh-Beacon Bridge. Lucy (the GPS) wanted to guide us further south and across the Tappan Zee Bridge, but that led us too close to “The City” for my comfort. At 1222 we crossed the border into Pennsylvania and an hour later pulled off in Hawley, PA for lunch. Bypassing the usual fast food joints we choose Ellen’s Deli and enjoyed some delicious freshly made sandwiches and casual banter with the owner. Around 1400 we merged on to I-81, which would be our path for the next few days. The temperatures had risen to 57 degrees and we seriously considered trying to camp, which would be a first on day one of any of our previous Excellent Adventures. 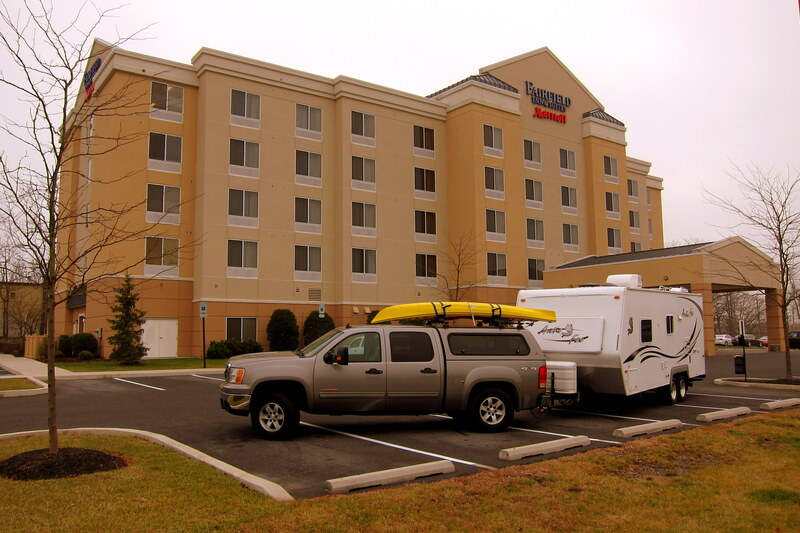 However not wanting to flush the antifreeze from the camper this soon, we settled on staying at our favorite Fairfield Inn just south of Carlisle, PA.
We should have arrived at the hotel around 1630, however some kind of major traffic tangle caused us to exit 8 miles early and take the scenic route through downtown Carlisle which added 45 minutes to our trip. Oh, in case you’re wondering, we still have the same old truck with 91,000 miles and same old camper with 62,000 miles. Kit would like a newer, larger and plusher rig however I’m still in the process of researching our next RV move. Can’t just rush into these things you know! I did treat the old girl to a new set of tires. The camper, not Kit……she’s still rolling on her old 35’s. 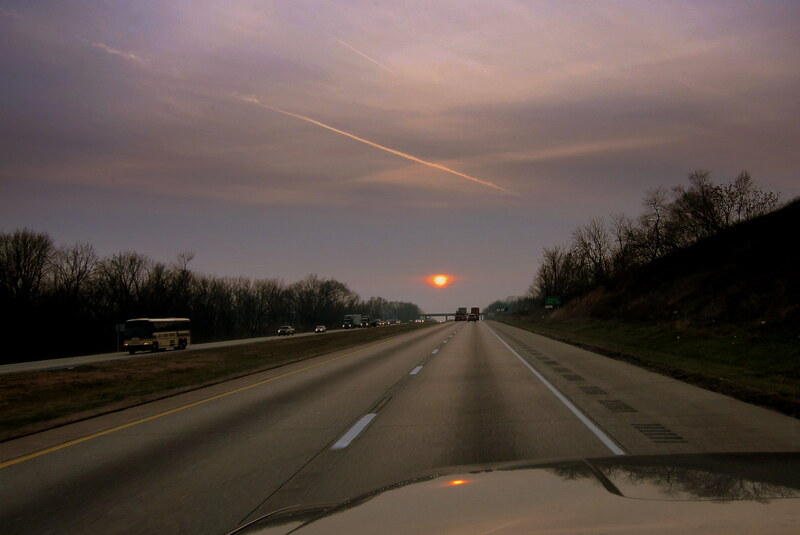 Thursday, December 5, 2013: On the road at 0840 hours following a restful sleep and a hearty continental breakfast. We are back on I-80 heading south under cloudy skies and a temperature of 51 degrees. Within an hour we crossed the Mason-Dixon Line and entered the Redneck state of Maryland. Ten minutes later we crossed over into West Virginia and an additional 20 minutes saw us pop into Virginia. It never ceases to amaze me that one can notch off so many states in such a short amount of time…..out west we take days to navigate through one state. 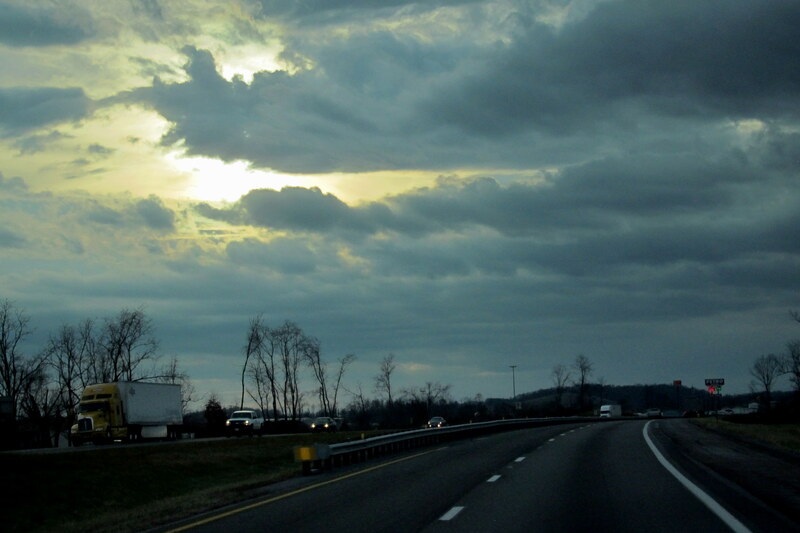 I-81 is a heavy long haul truck corridor and for the most part the truckers are very courteous to us slow RV drivers. As mentioned in the past, we feel far more comfortable sharing the interstate with professional truckers than commuters hell bent on getting somewhere while texting merrily away. On this year’s trip we were passed by dozens of electric utility service repair trucks heading south…..many towing trailers full of transformers and utility poles. Represented were utility trucks from New Jersey, Pennsylvania, Indiana, Virginia and other states. We’re assuming they were preemptively been positioned close to the projected track of Winter Storm Cleon…..a real bad actor that will impact our travels in a day or so. It’s been a long day and the sun is setting gently in the west. I wonder if the folks in that aluminum tube represented by the contrail in the photo below realize how much they miss by not taking the slow lane as RV’rs do? At 1630 we decided to stop for an early dinner at that famous southern restaurant, Cracker Barrel. Most of this particular chain of stores features long parking spots that accommodate the traveling RV public and so it’s a nice place to pull into for a meal……or even stay the night. Back on the road at 1730 we crossed into Tennessee a half hour later and, since the temperature had climbed to 70 degrees, decided to re-commission the trailer and camp. 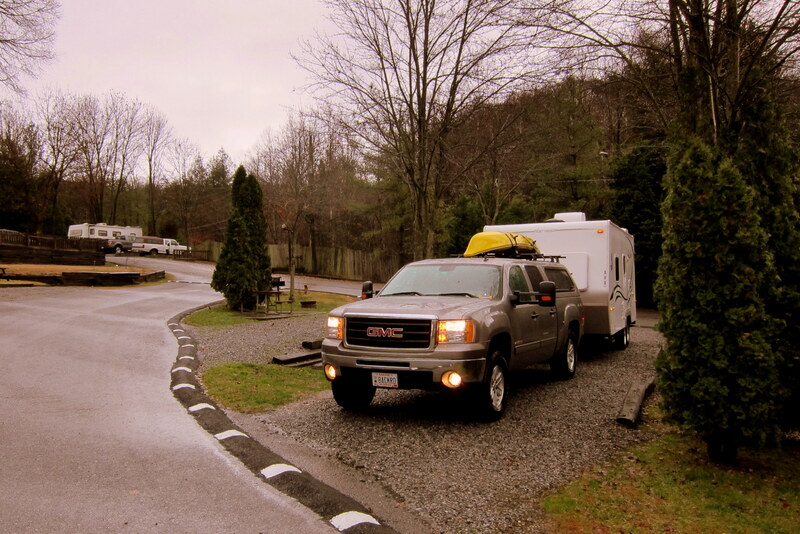 We pulled into the Rocky Top RV Park in Blountville, Tennessee, a place we have enjoyed in the past. Putting the camper back into commission is a relatively simple process. Drain the antifreeze, flush the lines with fresh water and check out all the systems. Well, even though I’ve done this task dozens of times, on this occasion I made a bozo mistake that got me in a bit of hot water (pun intended). Last fall, during the winterizing process I bypassed the water heater so as not to waste expensive antifreeze filling a six gallon tank. So the electrical heating element is pretty much suspended in air. Experienced RV’rs know where this is headed…..well, not a problem unless some dufus connects the shore power electrical cord with the water heater electrical switch on. Fortunately our water heater has two modes, electric and propane…..otherwise Kit would be taking cold showers, which would not be a pleasant outcome for poor old dufus. Friday, December 6, 2013: Woke to drizzly weather, the onset of Winter Storm Cleon, and to temperatures in the upper 40’s. We had a very comfortable and restful first night in the camper however. Getting on the internet to check e-mail and the weather we observed this startling graphic. Winter storm Cleon is making a mess of our intended path to the sunny southwest, which, as you can see, isn’t very sunny. We might just have to head for the yellow portion of the country instead. At 0915 hours we were rolling out of the campground and making our way back out to I-81. Now it’s decision time…..either start heading more westerly to save some miles and time and possibly run into the icy teeth of Cleon, or continue to head south until it gets warmer and then head west to sneak under the belly of the winter beast?!?! OK, that all sounded a bit melodramatic, but with a storm with the sissy name of “Cleon” and one that has been hyped to extremes to boot, I felt the need to invoke an element of danger and adventure to our decision. Viewing this brooding sky out our truck windshield cemented our decision. We decided to continue south and plotted a course for one of our favorite winter hangouts, Pensacola, Florida. Merging onto I-40W toward Knoxville then onto I-75S toward Chattanooga, Tennessee we noticed a large RV dealership with a service and parts department. Since I now need a water heater electrical element we decided to pull in. As I made my way to the parts counter Kit decided to Oz around the store and look for suitable camp chairs since our five year old ones had finally worn out. As I headed back to the retail store with my repair part in hand I came upon this sight. Kit chose this chair for her and an old upturned milk crate for me…..welcome to my world! Back on I-75 the rain started picking up in intensity and the wind began to pick up in velocity. Just as we were deciding whether (or is that weather?) we should pull off the highway and seek shelter, we punched through the southern edge of the storm and within minutes the sun appeared for the first time in two days…..Yea! At 1407 we crossed into Georgia and the Central Time Zone. It’s nice to have that extra hour as we haven’t a clue where we will be staying tonight. By 1500 the temperature had risen to 68 degrees and we merged onto I-59 continuing south. Since our cupboards were suffering the Mother Hubbard thing and since Kit was suffering from a lack of Retail Therapy we probed old Lucy (the GPS…..otherwise this sentence would be just plain weird!) for the nearest Wal*Mart. After 90 minutes of Kit shopping and an hour and a half of my walking laps around the parking lot we were once again on the road with a considerably heavier load under tow. As we moved onto I-65 near Birmingham we began to get tired and hungry. 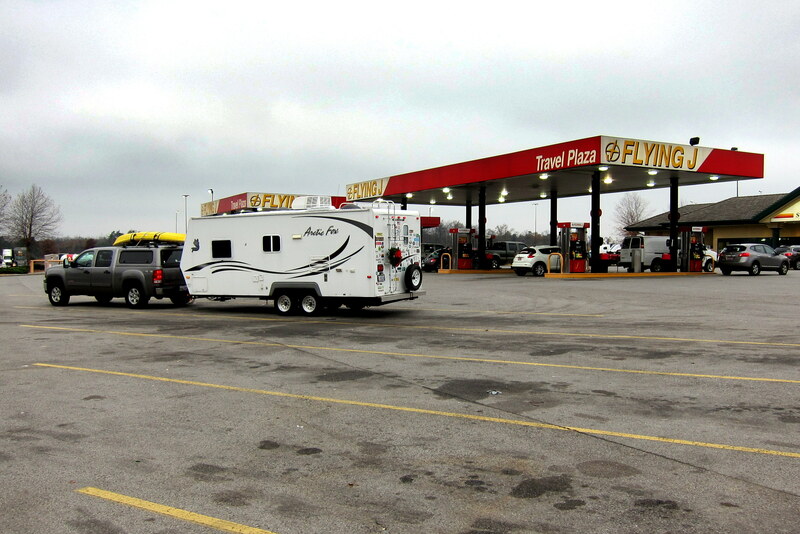 Fortunately, we came across another one of our favorite overnight quick stops…..a Flying J Truck Stop. This one, as most do, caters to the long haul trucker but also to the RV’ing public. They have separate RV fuel lanes with fresh water and dump stations provided…..one can fuel the truck, fill the camper water storage tank and dump the sewer holding tanks all from the same position at the pump. Pretty slick…..and as an added feature, with a Flying J Rewards Card you get an additional two cents off per gallon of fuel! In addition, they welcome you to pull into one of their level and well lit RV parking spots and spend the night. Since we were hungry and too tired to make dinner, we treated ourselves to a meal at the next door Denny’s Restaurant before settling in for the night. This is a very busy truck stop but we enjoyed a relaxing evening. At some time during the night we were joined by a couple of other RV’ers as well as a truck pulling a very large stock trailer. Don’t know what was in the trailer but the critters were moving about in their stalls and making a heck of a racket…..not enough to keep us awake for long however. Saturday, December 7, 2013: Up, breakfast in the trailer and back on I-65 south by 0840. Cleon has caught back up to us and it’s cold, windy and rainy. The iPhone weather app shows the temperature at our current location as 33 degrees…..so in order to seek some comfort that we are heading in the right direction we checked Pensacola’s weather, 65 degrees! Then just as a point of reference we checked our next major destination of Tucson, Arizona…..33 degrees. Yikes! 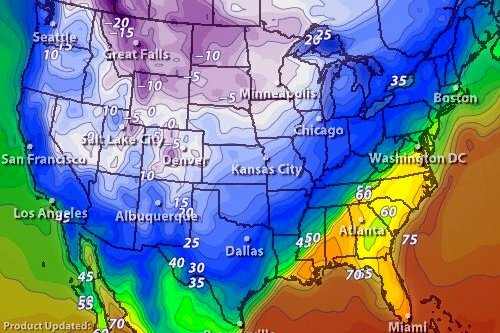 We might have to spend the winter in Florida! Around noon we pulled off the highway for fuel and decided to have lunch as well. In the middle of our meal we received a FaceTime call from our six year old grandson, Tucker. It was great seeing and talking to him, his brother Jack and our youngest daughter Suzie……please do more of that guys, it was the highlight of our day! Just a quick note concerning an interesting phenomenon; well at least to me, concerning trailer tires vis-a-vis trailer suspension and their associated support mechanisms. 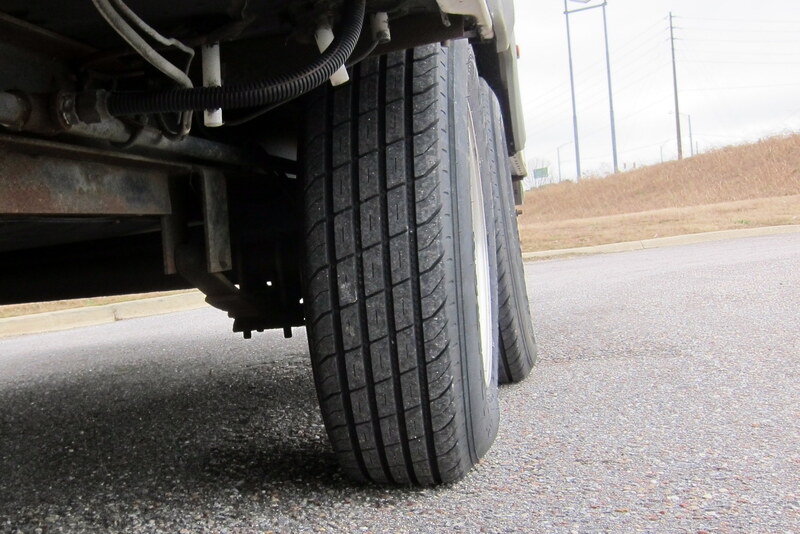 Trailer tires are co-parallel to the tangent of the supporting suspension and therefore do not articulate. With the dynamic stresses of a tight radius turn the tires disagree in alignment, such as was the case when I shoe-horned our rig into a tight parking spot at the restaurant. This misalignment, verified using the “round earth model”, and the resultant scrubbing of vulcanized material from the tire surface may explain why we are on our third set of tires in only 63,000 miles! Hope you’re taking notes because I don’t have a clue what I just said! Back rolling, on said tires, heading south while Lucy pieced together a variety of Alabama back roads that delivered us to the Florida State line at 1342 hours. Then she cogitated a set of Florida back roads that led us to the US Navy Blue Angel Recreation Field and our stop for the night. Setting up in a very nice spot on Perdido Bay we decided to take a couple of down days to let Cleon blow by and to take care of some trailer and truck maintenance. Also it is time to just relax after being on the road the past four days. 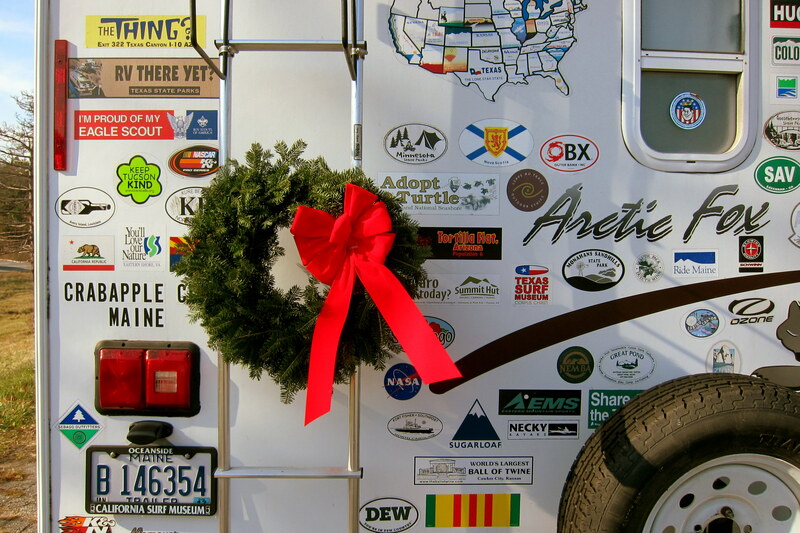 Before I close Journal #1, I wanted to include a photo of this year’s wreath attached to the back of the camper. This tradition is like the “Canary in the Mineshaft”…..when the wreath gets dry and brown its warm enough for us to winter over. Stay tuned…..might have an “Anchor Pool” where one can predict the exact date that the wreath spontaneously combusts! Still campaigning for my leather recliner! I suppose we will have to have an additional trailer to haul it with, though. So far, everything has gone well, considering the big giant storm we’ve had to dodge. By the time we arrived in Pensacola, it was 70 degrees and nearly 100% humidity; a huge change from our home state of Maine! We’re adjusting, though. Stay tuned…. Good evening this snowy Monday Dec 9th in Maine….measured about 3 inches of white stuff at 10 pm…turning to sleet at 25 degrees (68-70 in the house…much like Pensacola but low humidity!). So glad to hear of your travels once again…will track you as you go (or as you send your epistles!!). We have no visitors coming to Maine & we will not travel till mid February to Paris. On Oct 14 Stan tore a right knee meniscus ligament and plans are on the calendar for a scope on Dec 30…hoping after a couple of days on crutches I can start training to leap tall buildings….it will be a miracle since he couldn’t do that before. Jane has been have some side effects from one of her meds but is coming back to form. Hope to get back to square dancing in the New Year!. 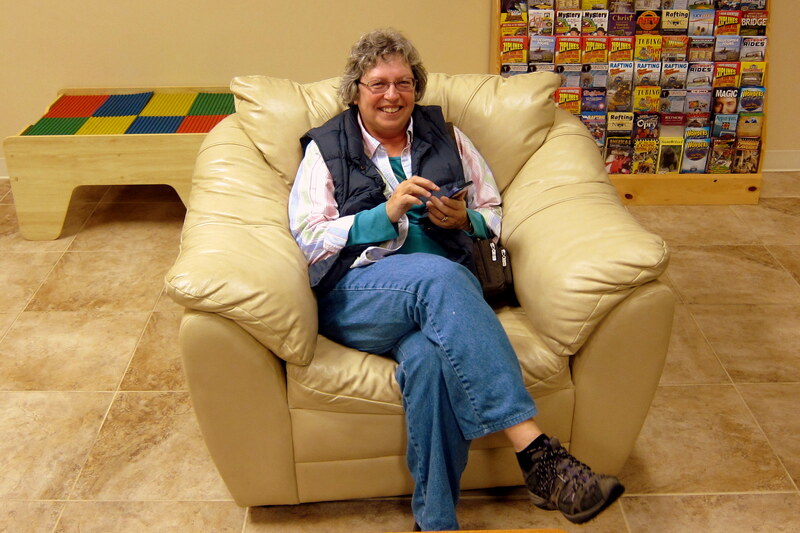 Hope you both continue fun on the road have only small mechanical repairs and Kit gets to enjoy (dreaming) of her leather recliner….thanks for including us on you e-list. Best, Stan & Jane P.
Hi folks, and thanks for the comment…..yours was the very first of the current trip! Hope you both are on the mend and looking forward to a very Merry Christmas and a happy new year! Did I leave my comments twice, if so , sorry. Are you going to make it to S.D. Ca. this year, if so we hope to see you. We’ll be in Tecate, B.C. Mex. by January, do you have your passports?? If not, we’ll make arrangements. Let us know. Good phone number is: 619-301-3251. Get a hold of us, we would really like to see you guys. Hi guys, sorry for the delay in replying but wanted to thank you for the comment left on our blog. Congratulations again on your retirement and welcome to or somewhat exclusive club! We will certainly keep in touch and try to connect at some point. Enjoy your new life on the beach in Sunny Mexico! As always….. Enjoying the blog! So sad you had to bypass Huntsville. Maybe on the return trip?! 🙂 y’all be safe and have fun! Love you guys! We were sad as well…..not only would it be nice to see you folks again but we want to explore Huntsville. Merry Christmas to you and Sam and hope you both have a great new year! Once again free entertainment which is always good. You guys have safe travels and we will see you again this summer back in Maine. Thanks pal, for the nice comment. You folks stay happy and safe as well! It’s always great to read about your travels. Still stuck working….waiting for my retirement time! Stay safe you two and I look forward to the next leg of the trip! Hi folks, thanks for the comment and the nice words. Retirement is indeed great…..I highly recommend it! We might return home from this trip by traveling up the east coast, so who knows? Glad to learn that you are on the road again…and by the time you get to Yuma it will be nice weather, i am sure…we are in a cold spell here but due to see 70 degrees by the15th. We traveled much of that same route through to Maryland after we left you in July. In PA, Amish families parked their buggies at shelters provided by WalMart, in the one we stayed at….love your travelogue, keep them coming! Hi folks, great to hear from you. Hope to connect at or near Yuma at some point this year. How long will you be at the LTVA? Merry Christmas! Thanks Verna, glad you’re enjoying the Travel Journal! YA ALL DODGED THE STORM BULLET. NASTY ROAD CONDITIONS HERE IN CENTRAL MAINE THIS MORNING, WE HAD ABOUT THREE INCHES OF SNOW, THE BODY SHOPS WILL BE DOING A BRISK BUSINESS TODAY. WATCH THOSE ARTICULATED SUSPENSION MANUVERS. HUH!! AS ALWAYS WE DO ENJOY FOLLOWING IN YOUR WAKE. DRIVE SAFE! HOLD ON TO YOUR WEINERSNITZEL. Hi guys, thanks for the comment and wiener advice! Please stay safe and warm in the icebox. looking forward to seeing you in the spring. Hi folks, great to hear from you down in Sunny Florida. We had thought about exploring your winter state this trip but opted to once again head west. Maybe next year…..please keep the light on for us. Take care and Merry Christmas! Hi Jane, we don’t understand…..it’s perfectly nice and warm here in Arizona. Take care, stay safe and Merry Christmas! Nice to hear from you guys…..travel/stay safe, Happy Holiday. Have fun <3. Nice read, winters coming to Me. Enjoy your direction. Hey Bob, we will and Merry Christmas to you as well. Nice start and so quick on the first chapter. Hope the rest of the trip is as smooth. Drive safe and see ya’ll real soon. We always enjoy the journal and look forward to more great winter reading–the best to you in your travels. Thanks folks, hope you and your family have a very Merry Christmas and a happy new year.